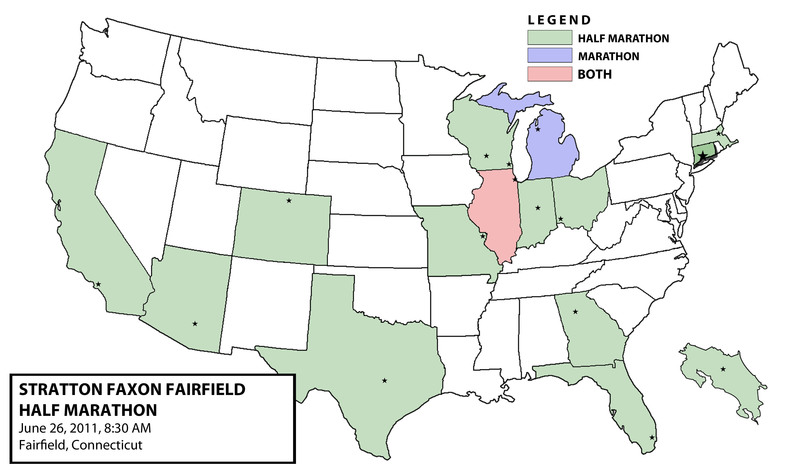 I realized early in my journey to run at least a half marathon in all fifty states that I’d have to tackle all those tiny states in New England. At the time, I was unsure about how to go about it — would I fly into each state, struggle to find a cheap stay in towns such as “East Windsor” and “Glastonbury”? Would I have to double-up on states to spread the costs? And is there even enough room in Rhode Island for a marathon? 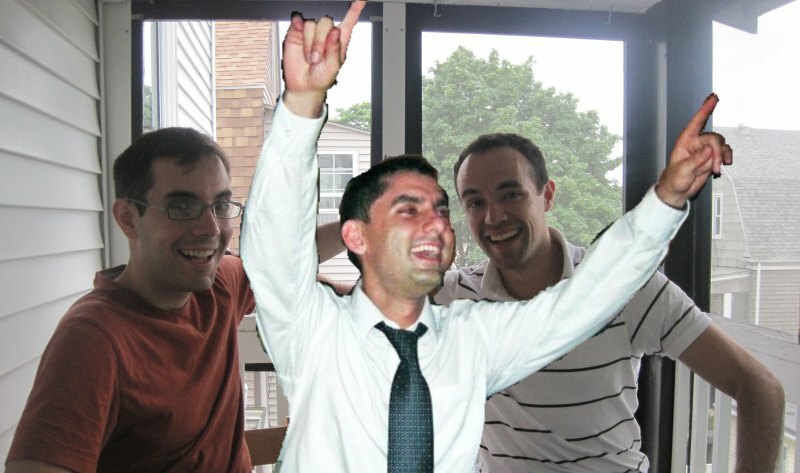 Luckily, my good friend Javier lives in Boston, recently betrothed to his longtime girlfriend, Erin. I’ve stayed with him on several occasions while visiting Boston, twice last year for a mutual friend’s wedding and for the 2010 Boston’s Run to Remember. I’ve known him for almost fourteen years, which, at this point, is half my lifetime. When I picked the Stratton Faxon Fairfield Half Marathon as my race of choice for Connecticut in early May and saw that it was a three-hour drive from Boston, staying at Javier’s and driving out became a sound option (the fact that hanging out with him is always a fun time definitely sweetened the deal). Though I actually invited myself to stay with him, I’m certain he would have extended his hospitality on his own as he has proven himself a generous host time and time again. I flew in Saturday morning and met up with him and Erin at their apartment, where we shared some Harpoon Belgian IPA’s on their back porch, watched “Murder by Death,” and ate at All Star Sandwich Bar (my third time). I had woken up that day at 3 AM to make the 6 AM flight to Boston, so my body was giddy at the prospect of sleep … for just four hours. At 4:30 AM, my alarm went off and thirty minutes later, Javier and I were on the road, cruising down a very foggy I-90 on our way to Fairfield. Temperatures were cool, in the low 60’s and the fog looked refreshing. I was unsure how the rest of the day would pan out, but the drive was cultivating an early optimism. We arrived at the marina adjacent to the race start at Jennings Beach, Fairfield around 7:45 AM. Crowds were quickly arriving and I was eager to go through the pre-race motions. I picked up my bib and dropped off my bag at the gear check, which was on the sands of the Atlantic Ocean next to the public bathrooms. There was a cool ocean breeze keeping temperatures low, but I could feel the humidity on my skin. It was difficult to say just exactly how the weather would affect me. I tend to perform poorly in heat and humidity, my times slowing down more than what I believe to be normal. But for this race, I couldn’t blame a bonk on poor nutrition or training. I hadn’t done any hill training exercises in months, but this course didn’t look too mountainous on paper, so I wasn’t too concerned. This was the first race I’ve ever done, of any distance, where the men and women started in separate areas, each with their own start line and timing mats. From the start, the name of the race seemed a bit hoity-toity (I joked with a few friends, telling them I was running the “Falstaff and Bibbington Gentleman’s Trot”) — the fact that the men and women started separate only seemed to humor this quality. That said, it was a fun feeling when, about 3 kilometers in, the men’s race met up with the women’s race, essentially doubling the field. It was also at this time that I noticed how fast I was running. My first mile was a 7:29, which was not at all sustainable for this temperature. By mile 3 I had slowed down to running 7:40’s, but I was already drenched in sweat. I wasn’t showing any early signs of fatigue, but the fact that I had already lost that much water wasn’t a good sign. I didn’t have much time to feign confidence before I was met with the first of many deceptively steep hills. The course for this race was 97% residential, 3% beach. 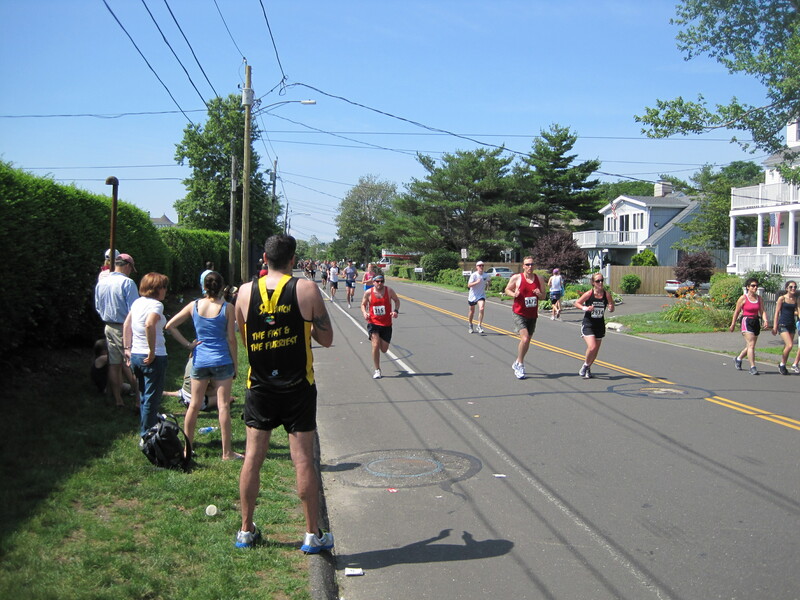 The entire course, from start to finish, was run along neighborhood roads populated by picturesque houses with large, green yards, often separated by large swaths of woodland. The shade was ample but it wasn’t enough to cool me down. By mile 4, I had already tackled several hills and my breathing had switched to a more intense rhythm. My feet shuffling quickly underneath me as I climbed upwards, I felt the energy quickly draining. By mile 7, I was already wishing for it to be over. I made up for some lost time by putting the hurt on the downhills, but I was enervated with every new upward slog. Around mile 7, I began noticing familiar places and I started cursing. I had no idea that we were returning to the starting line on the same course. All the previous uphills were now downhills – and I remember plenty of downhills. Brilliant. Obviously, this was my fault for not studying the course map ahead of time and starting off much too quickly. I kept asking myself, if you can’t handle this then how do you plan to run in South Carolina in two weeks? How about that September marathon in Mississippi for which you recently registered? With my body in the wretched process of collapse, I wasn’t finding easy answers to those questions. I had to play games with myself to keep going at a decent pace. Around mile 8, I started running on the yellow lines in between lanes, focusing only on keeping my stride right in between them. That worked for a while, but I missed a mile marker because I was keeping my head low and by mile 10 no distraction was enough to get my mind off the 3 long miles I had yet to run. 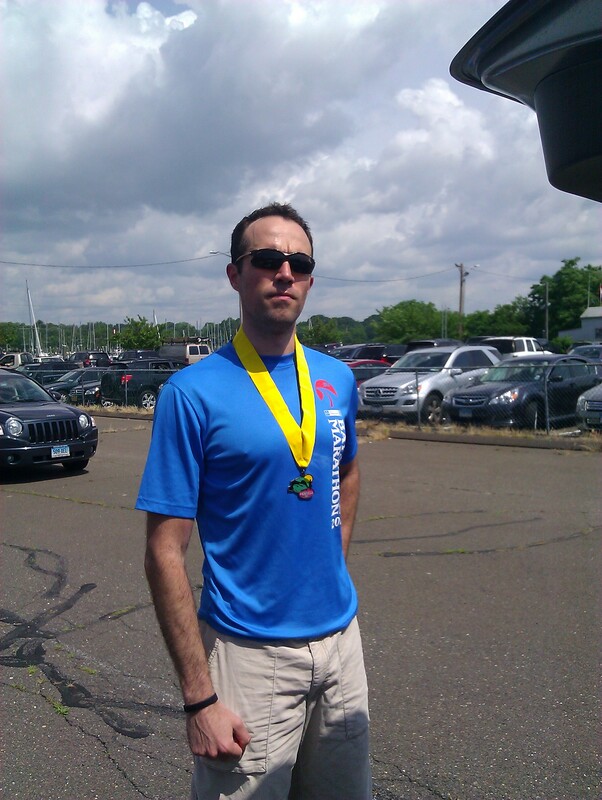 With every mile, I kept crossing off times that I could achieve (1:42 – 1:46 were out of the running), which normally would be a disheartening thing. However, since creating the goal to finish the distance in all fifty states, I’ve realigned my expectations and mantra: finish the race, finish the state. I used to run all races to PR, but I’ve come to realize, almost forcibly, that not all race experiences are equal. Sometimes everything lines up and you absolutely slay the course. 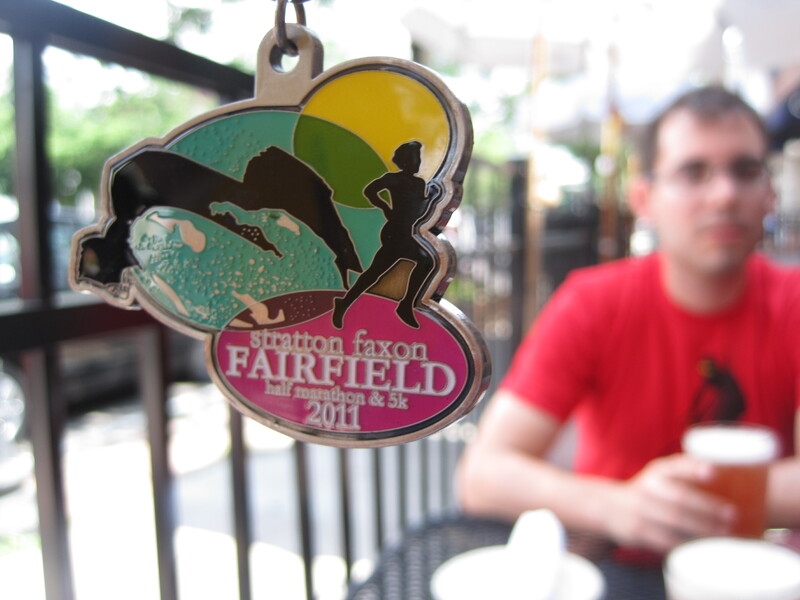 Other times, like the Fairfield race, you’re not as lucky. I saw Javier just before the 13th mile hidden in the crowd. I gestured a slice across my neck with my hand, indicating that I wanted this to end. 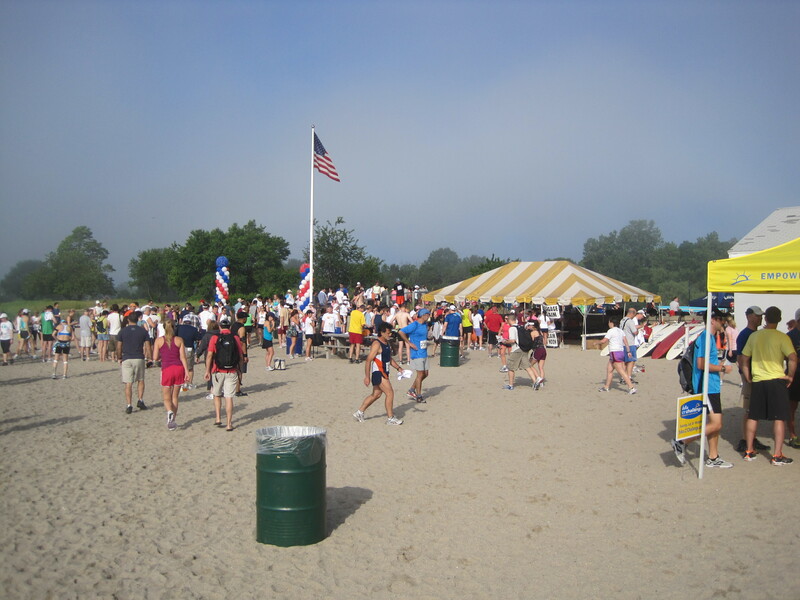 The last 0.1 miles are run on a gravel road that leads back to Jennings Beach, the finish line just beyond an enormous American flag. With absolutely no desire to sprint or even run over the finish mats, I kept my sluggish pace and stopped the clock at 1:48:37. Once done, I grabbed my medal and threw back five cups of water. 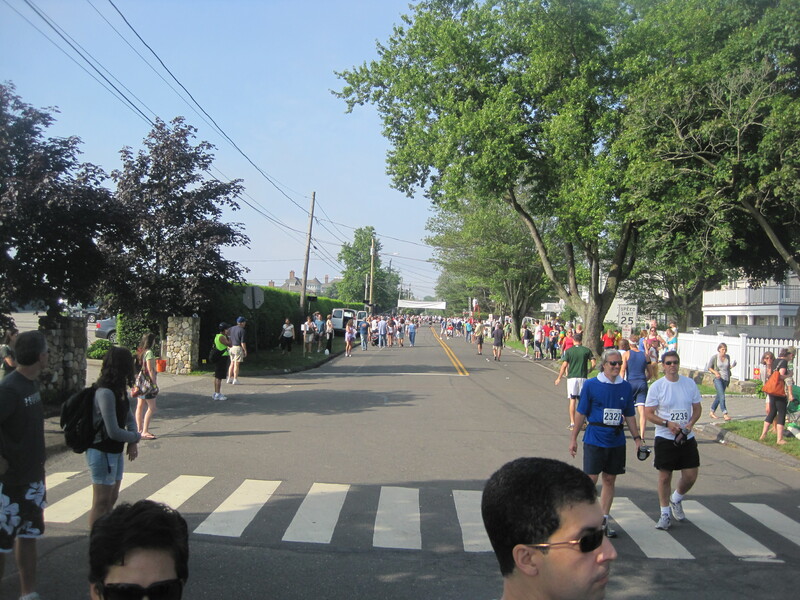 Most big races are very meticulous about their finishing chute, but Fairfield wasn’t. Although most finishers walked to the beach and some even dipped in the ocean (myself included), it was slowly becoming a chaotic mass of people. After an ice cold shower, I put on dry clothes, found Javier, and left the race in search of food. There’s a runner, a celestial body and … what’s all that garbage on the left? I have to say that I was a little disappointed in the race. Not because of my time, which would be understandable, but because Fairfield wasn’t the idyllic City on a Hill that I was imagining. I suppose I got carried away with my mental pictures of historic New England wharfs and assumed Fairfield was going to epitomize them. However, there was no elegant coastal town with airs of horse-drawn carriages and gentlemen’s duels. But despite that, Javier and I made a nice little day trip out of it. I’ve already told him that I’m looking forward to his continued hospitality in later summers as I journey to other states. Maybe the next one will have that intangible charm that Fairfield didn’t quite possess.